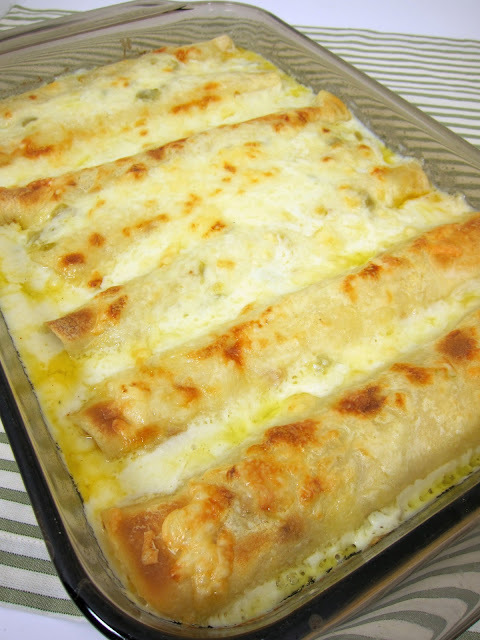 White Chicken Enchiladas - went to a dinner party last weekend had these enchiladas. They were SO good! SO creamy and delicious! No Cream of Anything Soup in them either! Wishing I had some leftovers for dinner tonight. In honor of St. Patrick's Day this weekend, I am doing all things green this week. These enchiladas aren't Irish, but they do have green chiles in the sauce. I found this recipe on Pinterest, my favorite place for inspiration. The original recipe is from Joyful Momma's Kitchen: it was all the rage on Pinterest a few weeks ago. I finally got around to making it and it was incredible! The sour cream sauce on these enchiladas was amazing! We couldn't get enough of it! I used full fat sour cream, I wasn't sure how low fat or fat free would work. Give this a try if you are looking for a good enchilada recipe without cream of chicken soup. Mix chicken and 1 cup cheese. Roll up in tortillas and place in pan seam side down. Making me drool so early in the morning!!! I made these from pinterest too. I think maybe I was the only one on the planet who thought they were on the bland side. I was totally bummed because I really really wanted to like them. I fines this post offenserative. Can I gits some DARK MEAT UP IN HEEEUH ??? I can see why these caused a rage! I like your green week idea and this dish looks incredible - just as you described it. I made them over the weekend too and thought they were amazing!! I only had light sour cream, light butter and canned chicken and still thought they came out fantastic. Next time I will definitely use some rotisserie chicken, but I didn't miss the extra fat from from the sour cream or butter. I made these last night, and my husband thought they were great. I used light sour cream, and it worked fine. Plain yogurt might also be a good substitute if you don't have sour cream on hand. Definitely adding this to our dinner rotation! Made these tonight for dinner - didn't have the green chilies, so I added some Franks Hot Sauce - Yummy! I discovered your blog thru ZipList. I came across this recipe and since then, my family has made it three times. We are in LOVE! I like all kinds of enchiladas but prefer the white cream sauce varieties like yours, this looks really good. I made these a couple of weeks ago and they were soooo good! I was worried my husband wouldn't like them since he is strictly a taco guy - but he loved them! Thanks for the awesome recipe! Katie - So glad this was a success! I made these last week and was a huge success!! I will say I did add something, I never follow recipe rules!! For serving, I added a small dipping bowl of taco sauce. I dipped my bites in the sauce, my husband just poured it over his and it really added an extra pop to the flavor. But I love how it was super easy, super delicious, and a just a bit different! Even my two year old ate it up!! Thanks again---so glad I found this site!!! Made these tonight and they were so good...did add a little onion powder to the chicken but followed the recipe otherwise and it is super. Thanks. I actually got this recipe from a little Mexican lady when we lived in Galveston Texas. Have made it for 30 years & still get raves on it! I use corn tortillas & dip them in small amt of grease in a skillet. Yum, yum! I make these, but I add corn and onions to the chicken. Sooooo, so, so yummy. I made these tonight and they were very very bland. Huge disappointment! This is one of my favorite meals to make...when i put the chicken and cheese in tortilla i also put some mild la Victoria's taco sauce to add flavor. The only thing I did different was cook my chicken in the crock pot with Chipotle seasoning. So yummy! I made these tonight using leftover chicken from your Cool Ranch Chicken Tacos. Hubby and I both thought they were great! Recipe is a keeper!! GREAT idea to use the Cool Ranch Chicken Taco meat! I will give that a try next time. This looks wonderful; thanks for sharing. I also wanted to express my condolences for your loss. Our fur-babies are just that...our babies. My heart was so grieved for you. I like flour tortillas way better but for enchiladas u have to use corn tortillas!! My husband and I both loved it!!! Thanks again for a wonderful recipe share. These were awesome! I followed the recipe exactly and they turned out better than I imagined. Are they too spicy with the green chiles? Can you use corn tortillas? We saute peppers of all colors with onion adds great flavor. I love this but I switched to corn tortillas. Flour got too mushy for me but it was perfect otherwise! Making these now. I'm sautéing a little onion and yellow pepper to add into the chicken and cheese filling. Also, I'm using pepper jack cheese to give it a little kick. Because I happen to live in the middle of nowhere I can't get my hands on rotisserie chicken, I'm just baking a couple large breasts that I will shred. I may add a little cumin into the sauce, but haven't decided. I'm sure these are going to be great! I wonder how these would work with whole wheat tortillas? Thinking of trying a healthier version use whole wheat, no butter, fat free sour cream, and low sodium chicken broth!! Whole wheat tortillas would be great! Be careful with fat free sour cream - sometimes it doesn't bake well! I usually use light sour cream. I haven't frozen them. I don't see why it wouldn't work. I don't think the tortillas would get mushy if you froze the casserole right away. Instead of making I roue, I 'cheated. I heated up a couple of cans of Stokes Green Chili with chicken, then mixed in the sour cream and poured over the top. This recipe looks awesome! I am definitely going to try it! I've read the comments, and for those who said it's bland, any good cook knows that you add to or take away from the recipe with your own discretion. If you think it needs salt, then add salt! The recipe is merely a suggestion of what ingredients you MIGHT need to cook the dish. Add to it or take away ingredients as it suits you. The ingredients, the preparation, and the cook time are all subjective.